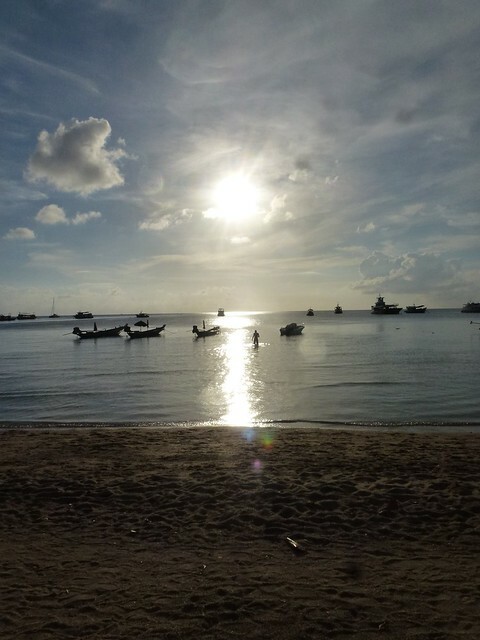 Time to move on and this time it’s a short boat ride further north to Koh Tao. 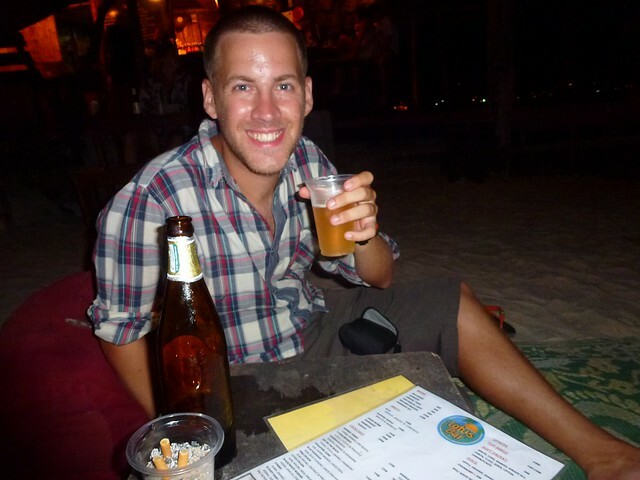 We stayed in the very cheap but cheerful Koa Tao Backpackers on Sairee beach, the main one on the island. 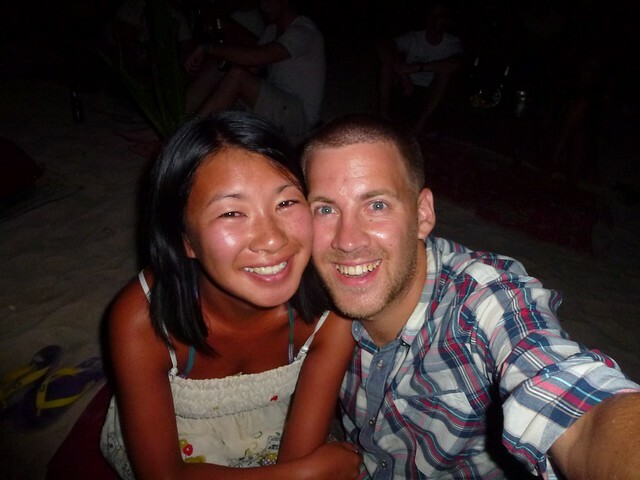 It was really sunny so we hit the beach straight away with a big bottle of Chang which was the start of a session. After the beer and watching the sunset we headed for some food in a little place on the main road. 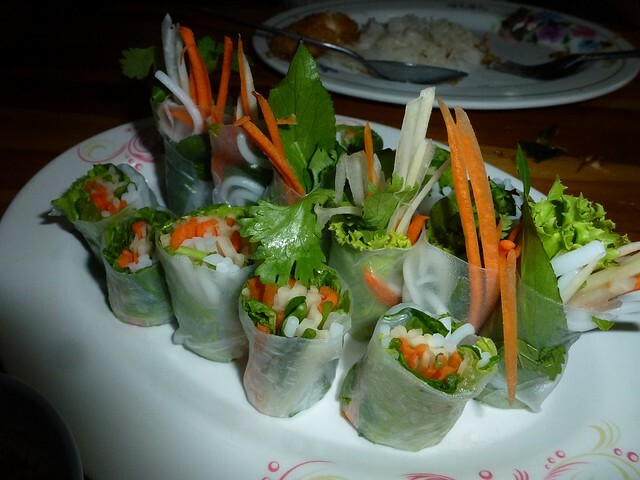 We had a huge meal which started off with some really good fresh spring rolls, then fish and a veg dish with another big bottle of Chang. Entertaining us was a troop of fire dancers who were amazing, throwing their fire sticks (or whatever you call them) in the air, to each other and then coming around the seating area and waving the fire right next to your face. We then headed onto the buckets which was a bad mistake. We both chose to have Sangsom and a mixer, ordering one bucket each. John finished his and then finished mine off. And then we had another big bottle of Chang which probably proved to be a little too much. He then ran out of the room off into the corridor. I was half awake and pretty drunk. The other people in our dorm had no idea what was going on and were laughing at this crazy white boy who was running around in a pair of boxers! I went out of the dorm looking for him and found him in a shower cubical. Checking he was okay, I made him open the door to let me in. He was stark bollock naked, soaking wet, his pants on the floor. The shower was on to help him calm down and he said “I thought i lost you, I thought you were dead!” At this point he started crying, crying because he thought that I was dead! Really strange but it was apparent at this point that something was altering his mind somewhat. I grabbed a towel, got him to put his pants back on and reassured him that in no way I was dead. I eventually managed to get him back into bed where he pretty much just passed out. You could see the madness in his eyes! Moral of the story, be careful with the buckets. 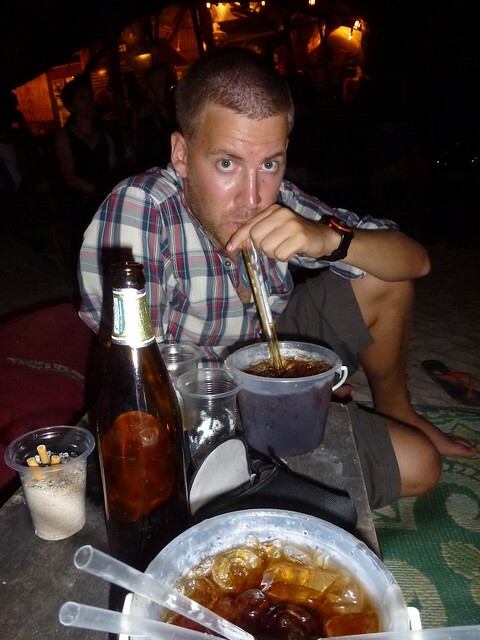 This entry was posted in Thailand and tagged beach, drunk, thai buckets. Bookmark the permalink. 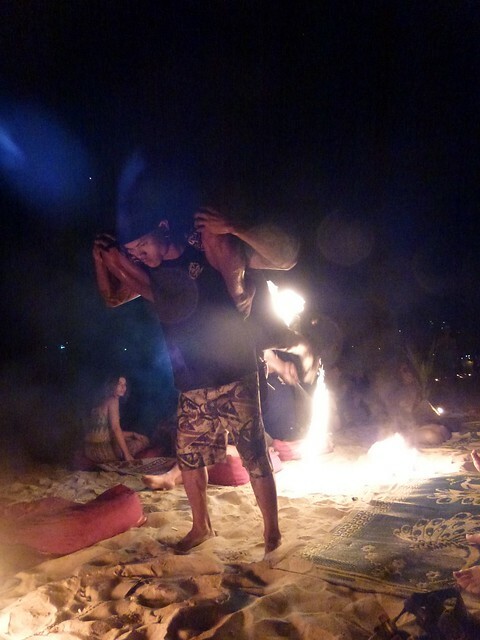 2 Responses to "Day 268 – The madness of Sangsom Buckets in Koh Tao"